Today’s classy entry comes to us via a pair of hunters. Both from the same server–Jaedenar –way to represent, boys! Neither one is guilded, so we can’t tell if they are 2 people who know each other and regularly play together or if RNG just decided to throw 2 players with questionable names together. I’m sure many guilds would kill to be represented by them. So we have 2 lovely hunter, one named Juicyloosie and the other Kumshot. Juicyloosie in and of itself isn’t too awful, especially compared to Kumshot, but both names together give an unfortunate mental picture. Actually I take back the RNG theory. These people have to be leveling buddies who created grossly named toons just to be gross. We just need to take a look at their pets’ names for further proof. Again, Juicyloosie comes out as the lesser of 2 evils. Your pet, the person who protects you and fights by your side, deserves something more classy than Douchebag. But poor little Douchebag probably thinks he has it pretty good compared to his pet friend. They should probably be ashamed that a troll is calling them out for not being classy, but they probably like the attention. Plus I wasn’t sure what they were running, so if they were running something new I would also have to build in time to research strats. So I was thinking no, but then she said they were doing MSV so I started to waver. I was able to sneak out early move some things around and even get some food and made a fashionably late appearance. Poor Zarigar. He was abandoned so long I don’t want to know how many things in his mail he lost. (Thanks again, Arv!) Even just looking at his toolbars I was like “wtf is going on here?” For some odd reason Zarigar and Khiaren–both elemental shaman–have different talents. I don’t really know what kind of game plan I had going on there. We get to the stone doggies and my favorite the jasper one is there. He chains me to Stunnah’s shaman, Smutt, and we do the little chain dance of avoiding pools. Little did I know that that would be foreshadowing of how intertwined Smutt and I would be. The drops were a spellcasting shammy’s dream come true. Even the things that weren’t shammy specific–rings, cloak, etc–were thrown at us since everyone else already had better. And thus we started the You Take It game. Other guilds have loot drama over ninjas and who gets what loot. Ours comes from over-politeness. Meanwhile everyone else was like MAKE UP YOUR DAMNED MINDS!! ONE OF YOU TAKE IT!!! I think a set of shoulders got placed in my bag just so we could avoid the 5-minute dialogue after one boss kill. After MV there was enough time to start HoF. Oh, the Attunement boss. To get back to the title of this post, yeah, still can’t dance. Some attempts were better than others. I was, of course, dead for the boss kill. One day, bug, you will be mine. 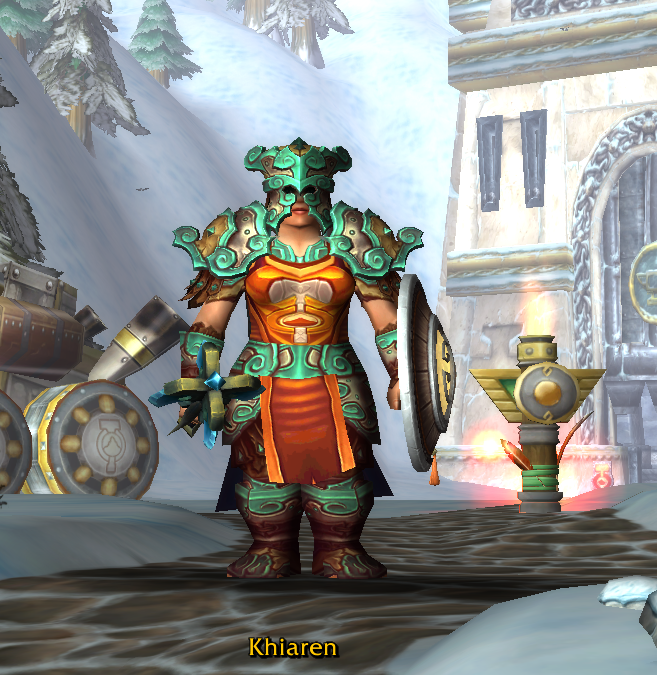 This past weekend I got to log in to Winterhoof and play Khiaren for longer than it takes to go to Darkmoon Faire and do their quests. For all the little bit I’ve done on Zarigar, it was kind of sad to see that I had done even less on Khiaren. She was 90 and had done some heroics, but that was about it. She didn’t even have the minimum level to get into LFR. Even though I knew she hadn’t done a whole lot, I still kept assuming she had, then got all sad when reality hit. For example, I sent her out to Dread Wastes to do some Klaxxi quests for some quick rep. Only I get there and see there is 1 whole daily available to her. Oh yeah, she’s still going out and waking them up. Gah! So my new, new plan was to get Khiaren LFR ready. She was actually only a couple of points off so in theory it should have been easy. One random Stormstout Brewery yielded nothing. So I decided to queue for Gate of the Setting Sun. If you have a shammy to gear up this is the instance for you; potential loot includes: a mace, a shield, a ring and a trinket. Too bad none of those dropped when I ran it. However, since this was an abandoned toon it turns out Khiaren had never ran if before and could do the quests in there. One of the rewards was a new cloak to replace the GREEN one she was still sporting. That, combined with an upgrade of her alchemist’s trinket, got her right to the minimum. I was originally going to wait to turn in my Lesser Charms but I was curious to run her through an LFR so I just queued right up. 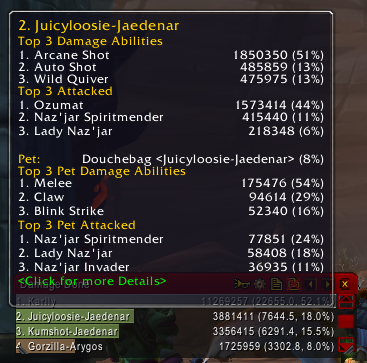 Ahh, that’s the LFR I remember. People stomping through the content. Me not anywhere near the bottom even with my cobbled together gear. No loot for me. Here I am, just a nooby little warrior. Pressing buttons and slashing things. Doing quests and picking up my rewards. Equipping those rewards because they are upgrades. There is no attempt at matching. I’m not trying to NOT match. That’s just what I get and what I’ve put on. Nothing is mogged. There is truly no rhyme or reason to this mess. There is kind of a purple theme going on with some of the pieces. The cloak is purple, too. Oh, it looks like I’m not wearing a cloak. Once upon a time there was a little blue goblin. He was a warlock, despite the fact that other warlock players drove me bonkers. So much so that they got their own “warlock hate” tags. Last time he had just completed Outland and was on the verge of Northrend. Now he is ready for Pandaland. How the heck did that happen? We can thank heirloom gear, increased guild XP and whatever nerfs Blizz did to those pre-Panda levels. Zhari did not set one single goblin foot into Northrend. It was all dungeon finder with a smattering of cooking & fishing dailies. I know I’ve mentioned this before, but thank you to whoever put all the dungeon quests inside each instance. No more slogging around outside working on questlines to open stuff up. Just kill, collect rewards and move on. Right before last weekend–Thursday? I think–he was ready for Cata. He didn’t quite have the ilevel to get into stuff and the AH was full of nothing but tumbleweeds, so I had to start actually questing. I had barely stepped foot into Mount Hyjal when the gnome mage came. Oh yeah, PvP. Forgot about that. I stayed there long enough to take the mole machine to Blackrock Cavern, then did a little bit of Vash’jir until my ilevel was high enough. Then it was back to the dungeons. That became the theme for the rest of the weekend. I would queue up, start to quest, then get called in and level up. The queue times for the early Cata dungeons was surprisingly quick. In Deepholm I only quested enough to get to the flying airship. I Uldum all I did was break out of the cage and get the prince back to his city. That’s it. At 84 the last 3 Cata dungeons opened up. That’s when the queue time went bonkers ridiculous. I got Grim Batol fairly quickly. Then waited and waited and waited. I actually had to log out to go do something else, then when I came back it was more waiting. Oh well, I’ll play around in Twilight Highlands. Sidenote: it’s Darkmoon Faire time, which means time for the merry-go-round of alts to work them through that. It also means checking on the various mail I have floating between toons before it expires out. That is where I found ilevel 400 SP trinket and dagger that was being passed around…which had a minimum level of 80 to use. I could have had my warlock using that 4 levels ago. Sonofa—! At around 90% through level 84 an instance finally popped. It only took an hour and a half of waiting. Halls of Origination. This is the dungeon I like when I’m leveling and gearing up but hated as a heroic. And since I was so close to 85 already I really didn’t want to do it. But don’t accuse the little blue goblin of not being a team player. The new trinket and dagger boosted his dps hilariously. It’s rare that I can be doing almost half of the damage by myself. I felt a little bit like Zug or Adoe. Too bad you can’t steamroll past some mechanics. Like people not dropping down and releasing the levers for that first boss. It was kind of amusing to watch the dps just stand there attacking him while his shield was up. Bless their hearts. All I have to say is thank goodness for that lock portal. When we got up to that upper level they headed straight for Raj. I could have mentioned there were other bosses around, but right at the trash before the end boss I dinged 85. Then we killed the boss. Then someone said they thought there were other bosses there. So my little blue warlock has caught up with most of the other big kids. It’s weird that he’s now at the same point as some of my other toons that I’ve had for much longer. Just one weekend to get through Cata. And-I say it with caution-it might not be so bad to do the MoP stuff with him. We’ll see. I’ll have to actually venture out into the world and do quests now. No more running instance for quick XP. Probably most sad of all, is that he slowly got a little less blue as he phased out his BoA gear. 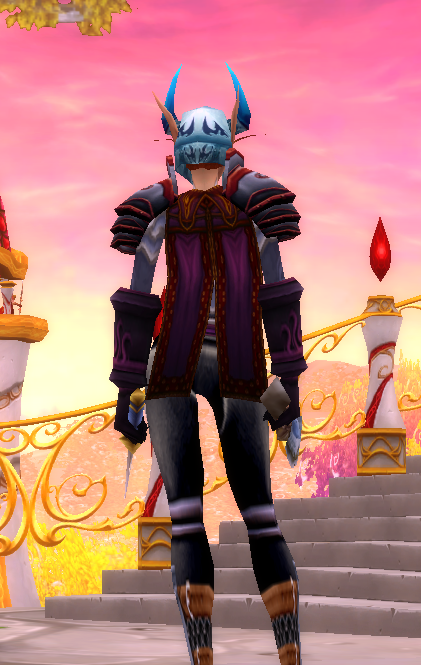 I could probably mog his stuff but I think it will be fun to see how he looks now with current gear. 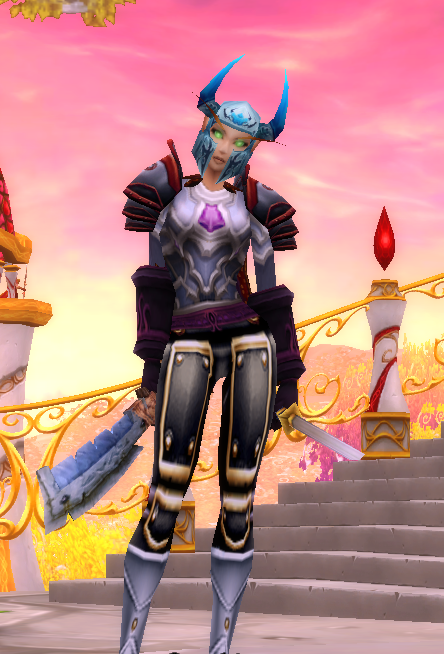 One of my favorite parts in taking a non-raiding toon through new content is how now all the gear will be an upgrade. He won’t have old content epics that would keep up with the first few levels of gear. Just that makes me think I might enjoy playing the warlock a little bit longer.